Alkalizing with Great vanilla taste in a sleek new package! 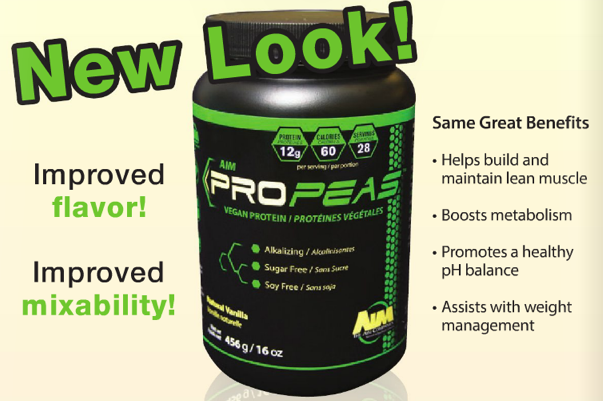 AIM ProPeas As a vegetable source of protein, AIM ProPeas® provides 12 grams of protein per serving in a low-sugar, low-carb, low-fat concentrate. Protein is a key component to weight management, helping with satiety, metabolic rate, and lean muscle mass. In addition, the vegetable pea protein in ProPeas offers a safe, allergen-free alternative to common whey and soy protein options. Sweetened naturally with stevia, ProPeas tastes great mixed into a smoothie or combined with chilled rice milk.